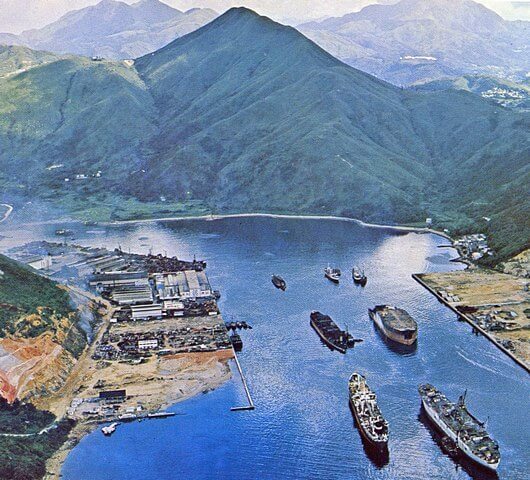 IDJ: These shipbreaking images were taken in the Junk Bay (Tseung Kwan O 將軍澳) area around the late 1970s or early 1980s. Junk Bay like Gin Drinkers Bay seemed to change by the month during this period with continuous reclamations so it’s very difficult to recognise some places over time. Especially when hills and mountains are flattened. In the second image of a ship being prepared for breaking one of the sheds in the background has ARGOS written on it. This company was a contract labour supplier to CLP for a long period and ran their own fleet of double-decker buses to get their people to the Castle Peak Power Station site when it was under construction. When delivered from the UK these buses had the livery of which ever towns they were sourced from complete with UK destination rollers still in place. This article was first posted on 26th June 2014. HMS Minden – a Hong Kong first? Shipbreaking is an important industry in Hong Kong because the market for scrap is geared to the building industry, where the demand for mild steel bars may be as high as 16,700 tons a month. To meet this demand as many as 30 vessels each averaging 7,000 gross tons may be in process of demolition at any one time. In addition, there is a demand in south-east Asian countries for mild steel rods and bars, and this is met in part by Hong Kong. Chiap Hua Manufactory Co., (1949) Ltd – Fung House, 9th floor, Hong Kong. Chung Hing Enterprises Co. – 811, Central Building, Hong Kong. Dah Chong Hong Ltd – 77, Des Voeux Road, Central, Hong Kong. Far East Metal Industry Corp. – Kun Tong Road, Kowloon. H.K. Iron & Steel Works, Ltd – 932, Union House, Hong Kong. H.K. Rolling Mills Ltd – 1437, Union House, Hong Kong. H.K. Salvage & Towage Co., Ltd – Union House, 7th floor, Hong Kong. Kowloon Steel & Iron Works – L.S.O. 151-1766-50, Fok Wing Street, Kowloon. 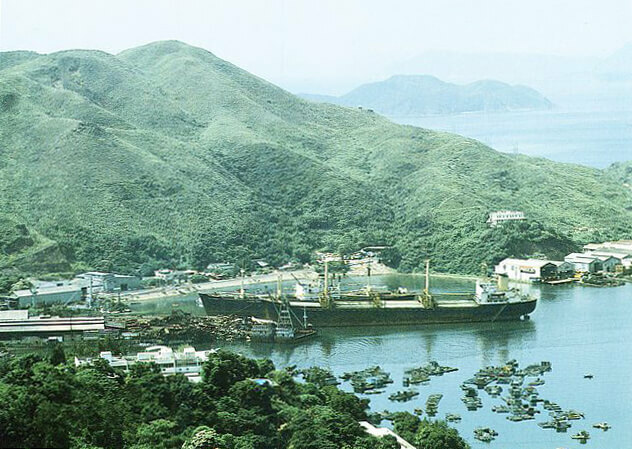 Leung Yau Ship-breaking Co. – 518, Li Po Chun Chambers, Hong Kong. Luen Hop Loong – K.M.L.-84, Waterloo Road, Kowloon. United Oversea Enterprises Ltd – 101, Yu To Sang Building, Hong Kong. Patt Manfield & Co., Ltd – Prince’s Building, Hong Kong. Saigon Shipping & Trading Co. – 1609, Central Building, Hong Kong. Shiu Wing Co., Ltd – 86, Jardine House, Hong Kong. Sun Sun Enterprises – China Building, Hong Kong. Shun Fung Ironworks Ltd – 605, Fu House, Hong Kong. Four Seas Enterprises Ltd – 336, Wang Hing Building, Hong Kong. Man Lee Iron Works – 112, Connaught Road, Central, Hong Kong. Teh Hu Steamship Co., Ltd – 1608, Hang Seng Bank Building, Hong Kong. Agencia Comercial “Progresso” Ltd – Alexandra House, 4th floor, Hong Kong. Lee Sing Co. – 170, Wing Lok Street, West, 2nd floor, Hong Kong. ARGOS was a subsidiary of the then Chung Wah Shipbuilding & Engineering Co., Ltd. The shipyard was in Yau Tong.